Running vertically (north/south) just like a finger, Seneca Lake spans Ontario, Yates, Seneca, and Schuyler counties. From a geographical perspective, it is located in the center of the Finger Lakes, which could provide a certain mediating effect as far as weather is concerned. At 38 mi./61 km. 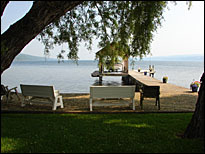 long, Seneca Lake is the second longest of the Finger Lakes. At its widest point, it is nearly 3 mi./4.8 km., making it the widest of the lakes. The lake with the largest volume--roughly 4.2 trillion U.S. gallons--Seneca Lake holds 50% of all the water in the Finger Lakes. 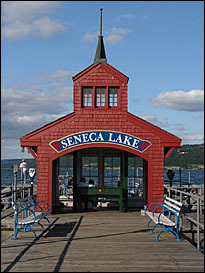 Seneca Lake is also the deepest of the Finger Lakes at 618 ft./188.3 m. and the second deepest lake in the country (by depth below sea level). Named for the Seneca Indian Nation, one of the six nations of the Iroquois Confederacy, the word seneca is thought to be derived from the Indian word assiniki, meaning "stony place" or "place of stone." Some people speculate that this refers to the southern end of the lake which has the steepest shoreline of any of the Finger Lakes. However, there are also many streams feeding into Seneca Lake with rocky gorges and beautiful, stony waterfalls. Seneca Lake is classified as a mesotrophic lake with adequate phytoplankton levels to feed a variety of fish. The lake provides drinking water to about 70,000 people and is clean and relatively clear--about 3 ft./1 m. in the summer and 30 ft./9 m. in the winter. As with many of the Finger Lakes, an ancient salt bed lies below Seneca Lake. This salt mixes with groundwater to make a brine that is processed in Watkins Glen into salt. Zebra mussels (Dreissena polymorpha) appeared in the lake in 1992. They are the only non-native mollusk. Native mollusks in the lake include four species of clam and four species of snail. The lake supports a variety of aquatic vegetation, including the non-native Eurasian milfoil. Interestingly enough, a 1994 study by Robert L. Johnson of Cornell University found that overwintering caterpillars of the aquatic moth Acentria nivea preferred the milfoil as a host plant. The lake contains many species of fish, some native and some non-native. The lake's rainbow trout population, though, is considered to be self-sustaining and reproduces mostly in Catharine Creek, which feeds the lake from the south. In addition to fish, the lake and surrounding area is home to a wide variety of wildlife. Seneca Lake is considered an Important Bird Area by the National Audubon Society, especially because, since the lake is so large and almost never freezes over, it provides an important wintering area for thousands of waterfowl. The Watkins Glen Waterfront, also known as Seneca Harbor, if well worth a visit. Clean and pleasant, the harbor has a lovely public pier (great for an early morning breakfast), a boardwalk with public restrooms, a public boat launch, the village marina, a breakwater that provides excellent birding opportunities, boat tour launches, a restaurant, a gift shop, public parking, and a miniature golf course. Next to this area is the Seneca Harbor Wine Center. 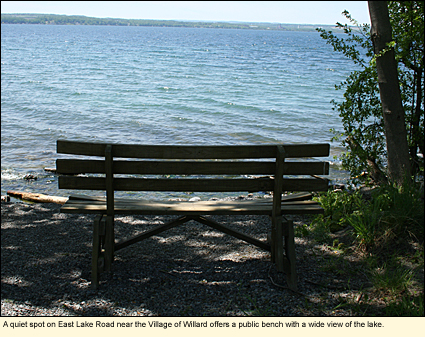 Seneca Lake is said to be good for windsports especially in the vicinity of Seneca Lake State Park. However, there are no places to rent or buy equipment in that area. Bring your own so you won't be disappointed. 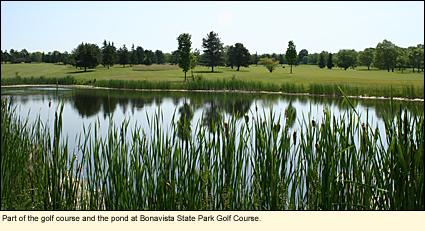 Although the 9-hole, par 36 golf course dominates the park, Bonavista has nearly 250 acres of woods, scrub, unmowed grass, and fairways with several ponds and a small gorge. Great for golf, wildlife watching, and, in the winter, cross-country skiing and snowshoeing. Off County Road 136 about 5 mi./8 km. west of the Village of Lodi, this park has a hard surface ramp and parking for 68 vehicles. Open year round. Pavilion and picnicking facilities. Pets must be leashed. Sampson State Park was once a naval training station, then an Air Force base, before becoming a state park. Military roads and buildings have been replaced with grasses, wildflowers, shrubs, and trees on flat, rolling woodlands surrounding ravines. 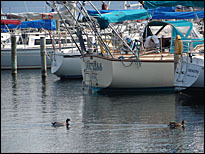 On beautiful Seneca Lake, the focal point of the park is the 103-berth marina for seasonal and transient boaters. There are 245 electric campsites and 64 non-electric sites, picnic areas, playground and playing fields that include tennis, basketball and volleyball courts, a swimming beach, a recreation building, and organized activities including tours, hikes, and wildlife watches. The park is open year round. Camping from May through mid-October. Pets must be leashed. The park is home to the Sampson Air Force Base Veterans Association Memorial Museum and the Samson World War II Navy Veterans Memorial Museum. Seneca Lake State Park offers a wide variety of recreational activities for both children and adults. Children will especially enjoy the sprayground with its 100 spontaneous jets of water. The playground is designed for children ages 4-12. The park also has 2 well-equipped marinas with 132 electric slips and 84 non-electric slips. Transient slips are available at both marinas. Operated by the Town of Hector, this park provides camping, picnicking, and boat launching facilities. Beach, showers, nature trail. Open from the first weekend in May through the last weekend in September. Geneva Chamber of Commerce--In the City of Geneva on Rts. 5 & 20. Launch ramps and temporary dockage. Brochure. Montour Marina/Canal Launch--Off State Route 14 on Marina Dr. in Montour Falls. Severne Point--On Severne Point Rd., of State Route 14, 8 mi./ south of Dresden. Hard surface ramp. Parking for 12 vehicles. Open year round. Brochure. Watkins Glen--Off State Route 414 on canal portion of Catharine Creek. Hard surface ramps. Parking for 60 vehicles. Fee charged.